An abusive partner lashes out with hurtful or violent behaviour toward their partner. The abuser’s intent is to gain power and control over the relationship. The abuser feels guilt for the abuse. 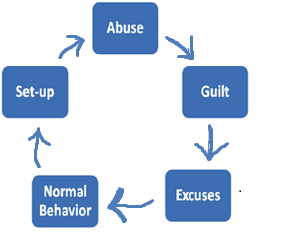 The abuser find reasons to excuse their behaviour and/or blame their partner for the abuse. The abuser does everything they can to regain control. The abuser may act as if nothing has happened, beg, use charm, or promise the abuse will not happen again. This peaceful “honey-moon” phase may give the abused hope that abuse will not reoccur. The abuser creates a situation where they can justify abusing their partner again.